Brian Johnson had the privilege of starting for Lowell at last season's Futures at Fenway event. However, that honor quickly turned into his worst nightmare as a batted ball hit him in the face, causing multiple orbital bone fractures and ending his season after just four starts in the organization. Having played sports his whole life, Johnson is no stranger to the injuries that come with the territory. However, this was unlike anything he's experienced in the past. "It was just different, because it was [not a pitching injury]," he said. "It wasn't like my arm was hurting or I pulled a hamstring, it was my face. [I didn't need] surgery, the only thing I had to do was let time [pass]. I think it was a total of three months, three and a half, before I was able to eat anything again and stuff like that." The left-hander took the mound in a spring training game Thursday, facing the High A squad of the Tampa Bay Rays. Though he showed no signs of hesitancy on the mound, he admitted after the start that that fateful batted ball is still on his mind. "I think it's natural [that] it's in the back of my head," the 2012 first-rounder said. "But every outing I go out, I notice myself forgetting about it more and more. So I think this [start] I had almost forgotten. But every outing I get a little bit more confident about it." "It feels good to be back out here, and in the swing of things and pitching again." The 22-year-old is looking to move forward from that incident and Thursday's start was another step in that process. He was inconsistent in his two-plus innings of work, but still showed the ability that makes him one of the top left-handed pitcher prospects in the Red Sox system. "My arm is starting to respond, it's coming around," he said. "From college, it's different going on five days rest instead of seven. I'm responding well and everything feels great." Johnson doesn’t have overwhelming stuff, instead relying on his command and ability to mix four pitches to get hitters out. His command was a bit off Thursday, especially with the fastball. He also left a few up in the zone, and hitters consistently made solid contact when he missed in that location. When he worked down in the zone he was very successful, on the other hand, striking out two batters on low-90s fastballs down in the zone. His curveball was his best secondary offering, showing depth and two-plane break back over the outside corner to right-handed hitters. He said afterwards that he threw all of his pitches in the outing, with the exception of his cutter which the team has asked him not to throw for now. Johnson raved about his time in Lowell last year, citing manager Bruce Crabbe and pitching coach Paul Abbott as strong mentors. 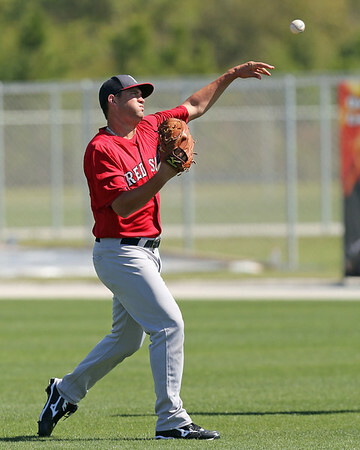 The transition to professional ball was made especially easy by the fact that two of his teammates with the Florida Gators were drafted alongside him in 2012 by the Red Sox. "Yeah, Austin [Maddox] and Greg Larson," he said. "We had both, so it was a very easy transition for us. Because we had all three of us to talk to, no one felt left out. We had someone to talk to if we needed it, or roommates and stuff like that." This season will be about moving forward from the accident he had with Lowell, and if he is able to do that, he can begin to work towards living up to the lofty draft expectations that come along with being a first-round pick. Ian Cundall contributed scouting notes to this story. Follow him @IanCundall. Matt Huegel is Managing Editor for SoxProspects.com. Follow him on Twitter @MattHuegelSP.